Data as Spock and Goose as Kelvin timeline Kirk. 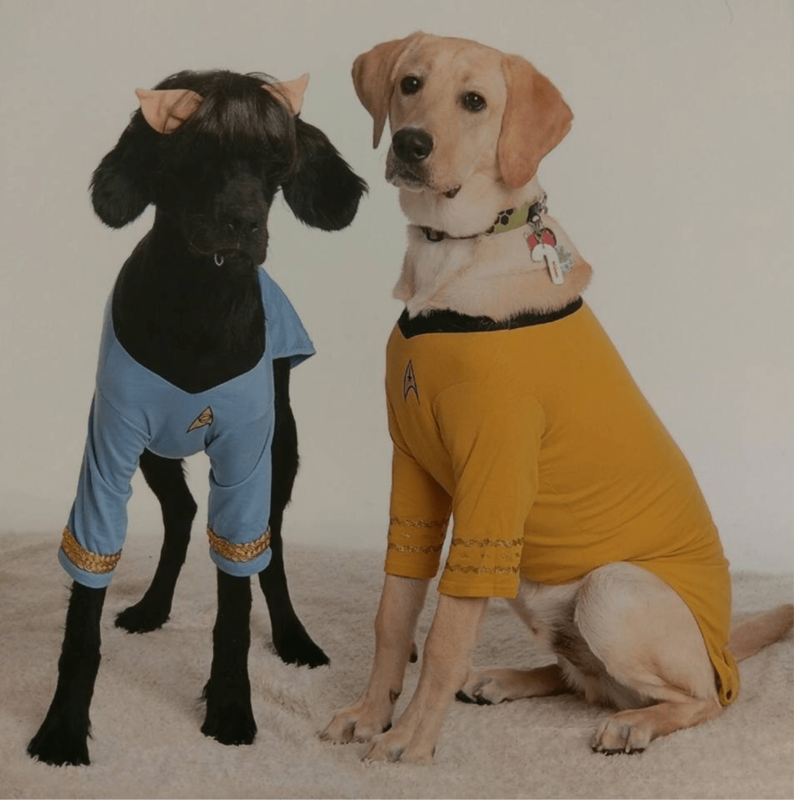 In my life, and especially during these times of darkness, the joy of Star Trek brings me is only surpassed by the joy of having dogs around. I have always loved them and I remember all the dogs I’ve met in my life, their names, and our history together. And just like Star Trek, they have helped me cope. 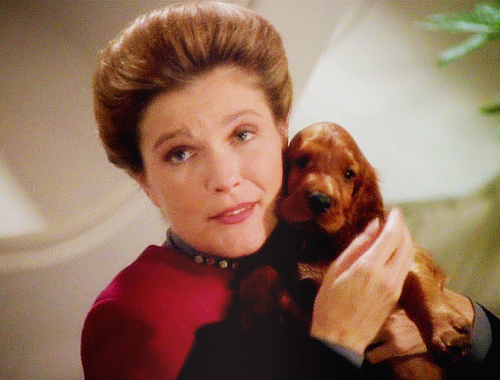 My first dog, Taffee, was just like Janeway’s dog, an Irish setter. In the first episode of Voyager, we learn about Mollie, a gorgeous red-haired and pregnant Irish setter. The captain is worried about her well-being and asks her fiancée Mark to take good care of her. This scene makes me reflect on my own life and how I have never, ever considered a partner who wouldn’t love dogs as much as I do. If someone wishes to share life with me, they must also love dogs. Although I love all dogs, fictional and in real life, I prefer larger breeds. I don’t trust small dogs, “never have and never will,” as Kirk said of Klingons in Star Trek VI – except maybe the unicorn dog in The Original Series’ “The Enemy Within.” It was cute enough for me to consider having one like that. Who could resist the nice version of an uni-dog? Loving dogs runs in our family. My daughter has a yellow Labrador retriever named Goose, whose personality reminds me of Lt. Barclay. Goose has many anxieties and although he doesn’t refused to use the transporter, he does refused to take baths. My son in law has a beagle called Loki, though many times I am tempted to call him Porthos. I cannot help but to imagine Loki in space being the best companion to one’s adventures. There would be no rodents on that ship, but there would be a lot of barking and much stinky-ness to bother not only female Vulcans, but all of us. Unfortunately, being a beagle is a risky business in space, just as it was dangerous here in Utah back in the 1950’s when “The Beagle Project” was created by University of Utah. To goal of this project, funded by the Atomic Energy Commission, was to advance science by experimenting on beagles, and the experiments were often cruel and painful. These prized beagles were chosen for their docile temperament, size and good behavior. Knowing this part of history, seeing Kelvin-timeline Scotty “test” his transwarp beaming theory on Porthos was not funny at all. Apparently in the future, beagles can still suffer from man’s cruelty in the name of science. When I came to the United States, I couldn’t bring Taffee and I didn’t know how long we would be apart. Just like Captain Janeway, I left behind my beautiful Irish setter while on an adventure. I missed her so much and thought about her often and lovingly. I never saw her again – she died while I was here. Nowadays, with my Trekkie husband, we have a rescue. Janeway’s Mollie was also rescued from a pound on Taurus Seti 4. 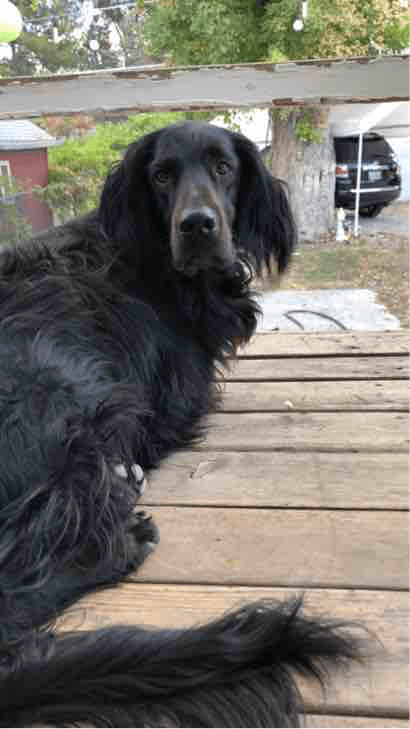 My dog is an Irish and Gordon setter mix. He is black with a shaggy coat, energetic, hates squirrels, and loves to run with me. We named him Data, like Picard would pronounce it. With Data and Goose, we spend spring and summer hiking and trail running. In winter, we cuddle and watch Star Trek together. Data’s his favorite character is Spot. Data keeps me company – he is sweet and silly. Though he might not be as a fierce of a guardian as a targ, he is the best companion for this adventure called life.